For the first time in many years, the Shops at Maple and Main streets in Pittsboro are filled with active businesses. To celebrate this business growth and encourage people to shop local this holiday season, the businesses on the northeast corner of Maple and Main have joined forces for a special holiday event. 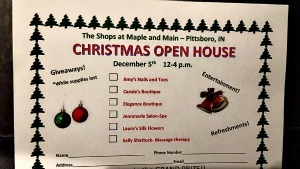 On Saturday, Dec. 5, the Shops at Maple and Main will host a Christmas Open House. This open house gives shoppers a chance to visit some great locally owned businesses, while enjoying holiday music and refreshments. Each shop will offer its own special giveaways, and shoppers who visit each store and have their holiday card stamped can be entered to win a special grand prize that includes hundreds of dollars worth of gift cards to local businesses. Winning would definitely make your Christmas merry! What a great opportunity to support local businesses and get your holiday shopping out of the way! When: Noon- 4 p.m., Dec. 5. Where: The northeast corner of Maple and Main streets in Pittsboro. Activities: Santa will be on the street to welcome you as you shop, and refreshments and giveaways are happening throughout the event at each store! For more great ideas on shopping local, be sure to check out our 2015 Holiday Gift Guide.